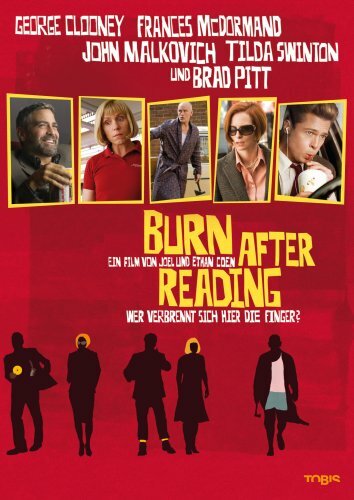 The Coen Brothers suffer, if at all, from an abundance of wit, leading to, as in the instance of Burn After Reading, a fast-thrown dialogue onto the screen ridiculing the modern day Rome on the Potomac. It’s put so poetically in the dark comedy by the protagonist Osbourne Cox: once the Cold War ended, the role of State became meaningless. It once had a purpose for being so intrusive and invasive into the private lives of its citizenry, to defeat the Soviet Republic and its tentacle arms worldwide which sought to overthrow the possessors of wealth in each nation by ensuring they did not quietly subvert the muscular overbearing power of the United States onto the world stage. Such vast machinery turned into bureaucracy, or organizing for its very sake, when we meet the protagonist being fired; the details as to the grounds of his termination are not discussed and rather pointless to mention. His termination simply sets up the rube Goldberg clockwork action that leads to unexpected hilarity as we canvass the empty basely material lives of those who feast at the tax payer trough; those who work for the State and those who support their lifestyles, which has turned the Washington D.C. area into a collection of the wealthiest zip codes in the entire country. There’s a very beautiful harmony struck between the classes of individuals depicted in the film; of the working class fitness instructors to the upper crust petit intelligentsia which serves in more intellectually rigorous manners. And how universally, they are bored with their lives and need reinvigoration; or as George Clooney’s character shares, a dawning realization of mortality leads them to pursue evanescent self-pleasures, as he further concludes in a defeated manner he is either incapable of leaving the world with something hereditable, or there is no point in doing so as he now lives by the mantra of more or less serving himself. And thus, he engages in adultery. And so too does his wife as we soon find out! It’s no wonder at all we have a world completely absent of children which by themselves can galvanize an individual to leave the world better than they received it, if for no other sake than out of the gratitude they have to their children for being alive. This unconditional love is indeed empty and shows a sweet melancholy in the entire film of quite simply unhappy middle-aged individuals with no aim and no purpose, paralleling eloquently the description of the State’s function in American society today. Most highly, then, with this upkeep and motivation for moving the ball forward in human history, is the commitment to higher standards, of a Higher Law, of living not simply by one’s moral code but of a higher one; and a discipline to maintaining a consistency with it. Intriguing then, that as the State has found itself purposeless after the fall of the Soviet Union, the empty morality of its human cogs make it a historically risible exemplification of greed and corruption; a place for those too ugly for Hollywood and too stupid for New York City and Silicon Valley to behave, again, like pigs at the trough, and who live for nothing higher but their own base desires. 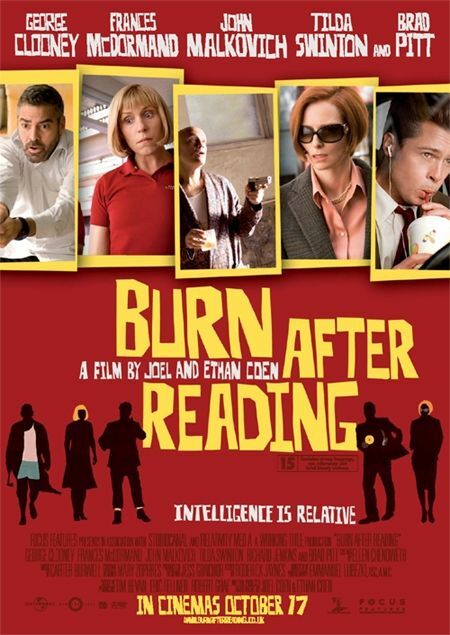 If anything, Burn After Reading, proves man is intrinsically a spiritual animal, whose emptiness cannot be quenched by the needs of the flesh; he will always need a lofty target to aim his bow, lest he turn downword into depravity. The Coen Brothers suffer, if at all, from an abundance of wit, leading to, as in the instance of Burn After Reading, a fast-thrown dialogue onto the screen ridiculing the modern-day Rome on the Potomac. It’s put so poetically in the dark comedy by the protagonist Osbourne Cox: once the Cold War ended, the role of State became meaningless. It once had a purpose for being so intrusive and invasive into the private lives of its citizenry, to defeat the Soviet Republic and its tentacle arms worldwide which sought to overthrow the possessors of wealth in each nation by ensuring they did not quietly subvert the muscular overbearing power of the United States onto the world stage. Such vast machinery has turned into bureaucracy, or organizing for its very sake when we meet the protagonist being fired; the details as to the grounds for his termination are not discussed and rather pointless to mention. His termination simply sets up the rube Goldberg clockwork action that leads to unexpected hilarity as we canvass the empty basely material lives of those who feast at the taxpayer trough; those who work for the State and those who support their lifestyles, which has turned the Washington D.C. area into a collection of the wealthiest zip codes in the entire country. It’s no wonder at all we have the world completely absent of children which by themselves can galvanize an individual to leave the world better than they received it if for no other sake than out of the gratitude they have to their children for being alive. This unconditional love is indeed empty and shows a sweet melancholy in the entire film of quite simply unhappy middle-aged individuals with no aim and no purpose, paralleling eloquently the description of the State’s function in American society today. Most highly, then, with this upkeep and motivation for moving the ball forward in human history, is the commitment to higher standards, of a Higher Law, of living not simply by one’s moral code but of a higher one; and a discipline to maintaining a consistency with it. Intriguing then, that as the State has found itself purposeless after the fall of the Soviet Union, the empty morality of its human cogs make it a historically risible exemplification of greed and corruption; a place for those too ugly for Hollywood and too stupid for New York City and Silicon Valley to behave, again, like pigs at the trough, and who live for nothing higher but their own base desires. If anything, Burn After Reading, proves man is intrinsically a spiritual animal, whose emptiness cannot be quenched by the needs of the flesh; he will always need a lofty target to aim his bow, lest he turns downward into depravity.